Robert Maćkowiak Great Britain and N.I. Kemel Thompson* Great Britain and N.I. Nils Duerinck* Great Britain and N.I. Quentin Iglehart-Summers* Great Britain and N.I. Ricky Babineaux* Great Britain and N.I. details Great Britain and N.I. Natoya Goule* Great Britain and N.I. 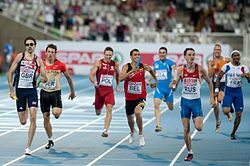 ^ "TRACK AND FIELD OLYMPIANS TO BE RECOGNIZED". University Park, Pennsylvania. 4 October 2012. Retrieved 14 August 2016. Blake, a member of Penn State's NCAA Champion 4x400 in 2008, also had a successful London experience, earning a bronze medal as a member of Jamaica's 4x400 relay pool. This page was last edited on 3 March 2019, at 20:40 (UTC).